Dr Lawrence Malisano completed his primary medical degree (MBBS) at the University of Queensland. After post graduate training in Queensland, he was awarded his Fellowship of the Royal Australasian College of Surgeons (FRACS). Subsequent Fellowship experience included appointments in Hip and Knee Arthroplasty at the Royal National Orthopaedic Hospital, London (United Kingdom), a Trauma Fellowship at The University Hospital in Bochum (Germany) and a Reconstruction and Trauma Fellowship at the Sunnybrook Health Sciences Centre, Toronto (Canada). Dr Malisano is a Senior Specialist at the Royal Brisbane and Women’s Hospital, Brisbane. 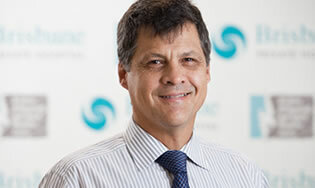 Dr Malisano has an education role with the University of Queensland Medical School, as faculty on Regional, National and International Courses for Orthopaedic Surgeons, and is involved in research and implant development. Dr Malisano is also a Fellow of the Australian Orthopaedic Association, a foundation member of the Arthroplasty Society of Australia (ASA), and a member of the Australian Orthopaedic Trauma Association (AOTS), the Australian Society of Orthopaedic Surgeons (ASOS), the Australian Medical Association (AMA) and a life member of Sports Medicine Australia (SMA), Queensland branch. Dr Malisano is the immediate past President of the Australian Orthopaedic Association, and is a Royal Australasian College of Surgeons Councillor. For details regarding Dr Malisano’s billing practice, please contact his Rooms. Dr Malisano does not have access to Intermediate surgical lists at the Royal Brisbane and Women’s Hospital.